Here at Chelton Brown we take the recruitment and training of our staff very seriously. The only way we can keep to our very high professional standards is to ensure we employ the right people and give them specific industry training. 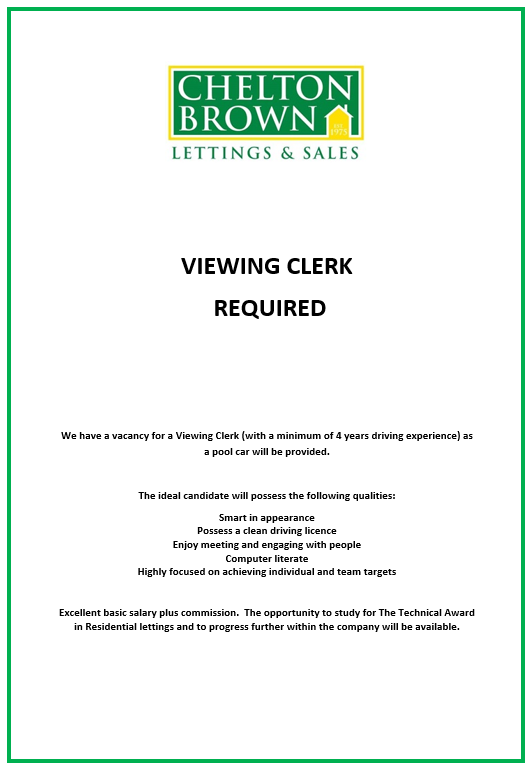 All vacancies are first circulated to the Chelton Brown staff. We follow an equal opportunities policy and always consider in house applications or recommendations first. If this does not produce a suitable candidate we advertise in the local press and on this website. Interested applicants are invited to submit CV’s which we study in detail. We like to interview at least six candidates for a position. The department manager carries out the first stage interviews. They narrow the applicant’s down to 2 suitable candidates who are offered a second interview with our Managing Director and asked to complete a position profile. We use personality profiling to make sure that candidates will fit in with our organisation. We are proud of our culture and will only consider applications from candidates with a profile that fits well with our company and the profile for the specific job. The successful applicant undergoes an induction and training to make sure they are confident before they are expected to work independently. Training starts on day one with inductions. All employees have a half hour with our MD who outlines Chelton Browns past, present and plans for the future. We hope this gives an insight into the motivation behind our success. The inductions last about a month, giving job specific training and a good overview of all the jobs within the organisation. After the 3 month probationary period, we expect all employees to work and study to gain the industry qualification the Technical Award in Letting and Property Management. This qualification covers all aspects of the business including the legal and statutory obligations of our clients. The award is a four part qualification and involves a lot of home study before sitting four separate multi choice exams. (Study is expected to be done in the member of staffs own time). Completion and passing these exams give the staff the confidence and ability to do a professional job for our clients. Working at Chelton Brown is like being part of a large family. We have a great working environment and fantastic work culture and ethic. Attitude is everything, we can train almost anyone to work within our industry, but if the attitude is not right, then they are not the right person for Chelton Brown. If you like the sound of the way we work, please send your CV to us. Even if there is not a vacancy at the moment, we admire people that put themselves forward and keep all CV’s submitted to us for consideration next time we have a vacancy.